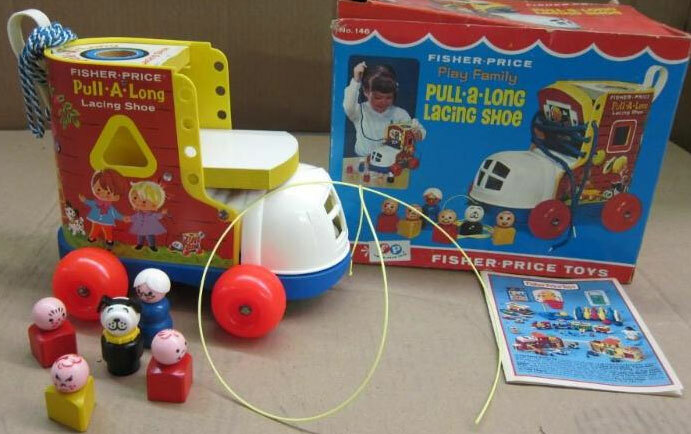 Description: The #146 Pull-A-Long Lacing Shoe is the third and final Original Little People play set that featured a shoe as the play base. The 1st was the #991 Music Box Lacing Shoe (1964-1966), which rolls on 4 plastic wheels and has a round metal cylinder inside that spins and plays music. The 2nd Little People set with a shoe base was the #136 Play Family Lacing Shoe (1965-1969), which is a shoe with no wheels. The #146 is the only shoe base of the 3 that has red plastic wheels. The shoe has shapes holes cut into the sides and top that the accessory Little People figures fit through. The figures can be removed from the shoe through it's hinged wooden tongue. The sides of the shoe have holes that child can lace a 50" long shoe lace through to teach him how to lace and tie his shoes. The figures used in this set are nearly identical to those used in the #136 Lacing Shoe. The only different figure is the mother. Though she has the same face and hair, the mother used in this set has a regular base opposed to the #136 bell-shaped base mother. When this set was first introduced, all of the figures were made of wood. 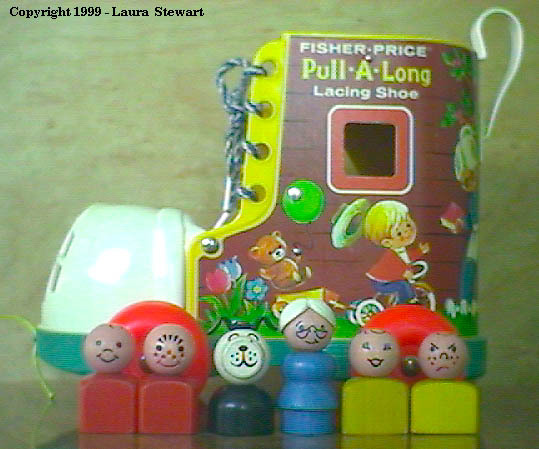 During the middle of it's production, Fisher-Price started using plastic heads on the wooden bodies. The last half of it's production all of the figures, except the dog, had a plastic head and wood body. B146A - Base - Shoe with a blue wooden base. The sides of the shoe have shaped windows for the accessory shaped figures to fit into the windows. The shoe has a blue and white braided shoe lace that threads through the holes in the sides of the shoe to teach children how to tie their shoe. The shoe's toe is white plastic and lifts up on a hinge to reveal a hidden section for the accessory Little People figures to stand. The shoe rolls on 4 red wheels with metal axles. Has a YELLOW plastic carrying strap. This is the more common strap color for this item. Overall size: 8-15/16" long, 6-1/2" wide, and 6-7/8" tall. *See "Variations" below. FPT1066 - Shoelace - 50" long braided blue and white shoestring. WFL: 07-AI-02-3-T. *See "Variations" below. FKWW or FKWP - Mom with a blue regular base body, white hair in a bun and wearing glasses. GZWW or GZWP - Girl - Susie - Yellow triangle-shaped body, smiling, and has a red bow painted on top of her head. GYWW or GYWP - Girl - Freckles - Yellow triangle-shaped body, frowning, has freckles on her face, and has a red bow painted on top of her head. DNWW or DNWP - Boy - Butch - Red square-shaped body, smiling and has freckles. DMWW or DMWP - Boy - PeeWee - Red square-shaped body, smiling. This Mom was all-wood during the early years of #146 production, but later came with a plastic head and wood body. This girl with a triangle-shape body is often thought to be a boy due to her frowning facial expression, but the bow painted on the top of her head tells all! During the early years of production, this character had a wood head and wood body. In later years, the character has a wood body and plastic head. The early version of this figure (all-wood) was also used in the #136 set. This triangle-shaped girl is a delight with her fancy eyes, smiling mouth and painted bow on top of her head. During the early years of production, this character had a wood head and wood body. In later years, the character has a wood body and plastic head. The early version of this figure (all-wood) was also used in the #136 set. This boy with a square-shaped body has a simple smile and red hair painted on his head. During the early years of production, this character had a wood head and wood body. In later years, the character has a wood body and plastic head. The early version of this figure (all-wood) was also used in the #136 set. Boy with square-shape body, "" eyebrows, freckles and smiling. During the early years of production, this character had a wood head and wood body. 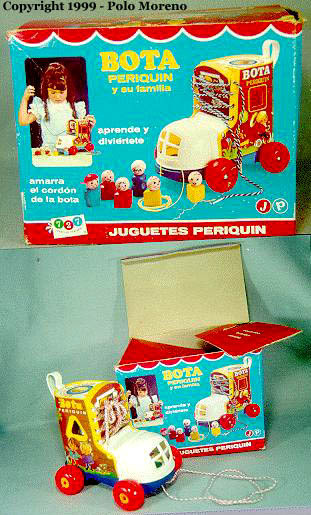 In later years, the character has a wood body and plastic head. The early version of this figure (all-wood) was also used in the #136 set. Bell-shape body dog. This all-wood dog is the only dog with this type of base. Unlike the 5 other Little People shown here with this set, this dog was never made with a plastic head. B146B - Shoe with a blue wooden base. The sides of the shoe have shaped windows for the accessory shaped figures to fit into the windows. The shoe has a blue and white braided shoe lace that threads through the holes in the sides of the shoe to teach children how to tie their shoe. The shoe's toe is white plastic and lifts up on a hinge to reveal a hidden section for the accessory Little People figures to stand. The shoe rolls on 4 red wheels with metal axles. Has a WHITE plastic carrying strap. This is the less common strap color for this item. Overall size: 8-15/16" long, 6-1/2" wide, and 6-7/8" tall. Shoelace - 50" long braided solid blue shoestring. 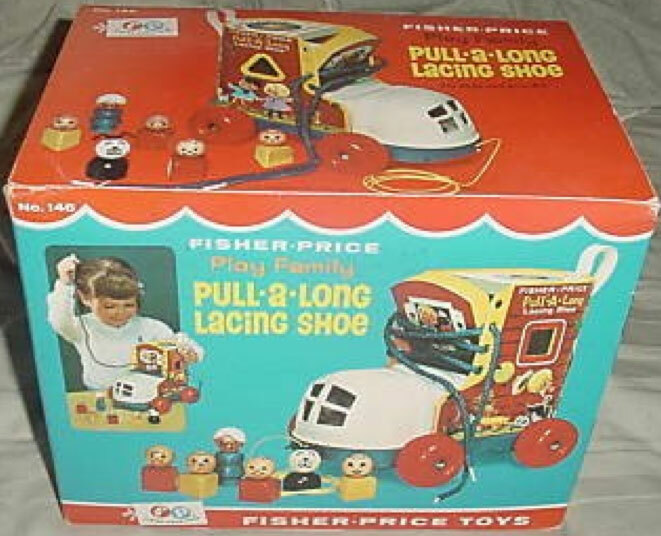 The 3rd was #146 "Pull-A-Long lacing shoe, made from 1970 until 1975. This shoe looks almost exactly like the #136 shoe, except the lithograph on the sides is a bit different, and this shoe rolls on 4 plastic wheels. Beware of Mexican impostor sets, as shown in the photo.